During the late 1880's plans to build a "Palace" to display and advertise Colorado's mineral wealth were finalized. The Colorado Mineral Palace was to be located on 27 acres north of the Pueblo business district and within a short distance of the Denver and Rio Grande Depot. Even though it was underfunded and difficult to complete, the Colorado Mineral Palace opened with great fanfare on July 4, 1891 with the Cowboy Band of Silverton, Colorado furnishing the music. Without a doubt the Mineral Palace was the most interesting building ever constructed in Pueblo. Its grounds were Pueblo's first major flower gardens. The world famous Colorado Mineral Palace was considered one of the show places of the West in 1890's. Housing the largest collection of minerals and gems in the world, the Mineral Palace was built as a monument to Colorado's mineral wealth and industry. Originally the idea of General Cameron of Canon City, the Mineral Palace was the realized dream of William H. "Coin" Harvey, a displaced West Virginian turned real estate operator in Pueblo, and who was William Jennings Bryan's campaign manager for President of the United States. A resident of Pueblo in the 1890's, Harvey was responsible for working out details of the Palace and raising the money for its construction. Architect and native Puebloan Otto Bulow's design was chosen from plans submitted by architects across the nation. Considered one of the most ornate and magnificent buildings then in existence in the United States, the Mineral Palace was essentially Egyptian in design. The entire façade had a colonnade and at each corner of the exterior was an eight-foot world between the column and roof. The building's principal dome was 72 feet high. It was decorated with female figures, 16 feet in length, representing the various countries of the world. Also in this dome were large paintings done in cameo effect, of eight great Americans. No one remembers who the eminent Americans were. It was surrounded by 20 smaller domes, 11 feet in diameter that were each exquisitely hand painted on the interior by D.R. Fay, the celebrated New York artist who adorned them with Colorado wild flowers and those of India. The general scheme of color of the building interior was terra cotta and gold, executed upon relief work in the East Indian style. Entirely around the interior ran a frieze composed of silver dollars encircling coat-of-arms of the various states and territories. Part of the decoration was the use of 2,200 electric lights in the hearts of the painted flowers. The interior of the Palace was a huge block-long hall with space enough for 3,500 persons for the various grand balls, meetings, plays, and other events held there. Reigning supreme over the hall were Queen Silver and King Coal sitting regally on their thrones. The gift of the Aspen silver mines, Queen Silver was modeled after Mollie Gibson and was embellished lavishly. Her hair was of white glass; her gown beautifully decorated with brilliants and minerals; her scarf sparkled with blue crystals. Her scepter was topped with a 12-inch replica of a silver dollar. The Silver Queen was 16 feet in height. She was transported for exhibition at the Chicago Worlds Fair of 1893. 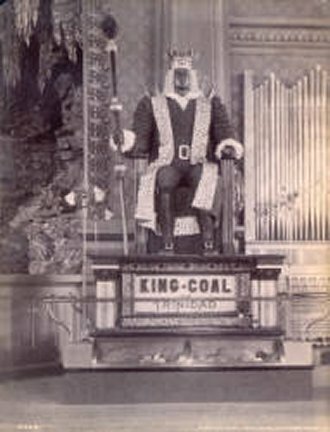 King Coal was 14 feet in height and was donated by the City of Trinidad to represent the area coal industry. Between the thrones of King Coal and Queen Silver was a huge stage on which many dramatizations were presented. The deep stage was in effect a large grotto, constructed of immense natural stalactites and stalagmites. In its center bubbled a mountain stream and a waterfall from which a mechanical nymph appeared at intervals to grasp sparkling nuggets. The exterior columns were of stone, 28 feet high and 5 by 7 feet at the base. The building was 134 feet deep and 244 feet long, facing south. The actual edifice was of wood, except the back side. Corrugated iron was used to enclose part of the north side. More than $150,000 was raised for the building, to put it in perspective the equivalent of $3,550,310 now. The building contained the largest mineral exhibit in the world at the time, plus fossils and petrifications from all over the globe. They were displayed in glass cases at the base of the columns and along the side walls. Small anterooms on the sides were reserved for afternoon tea. Crowds of early-day Puebloans and tourists gathered at the Palace for stand-up suppers. Despite signs of No spitting on the Floor , sawdust was brought in for protection. Mineral Palace was built before Pueblo had created park districts. By 1895 the Colorado Mineral Palace Company was in serious financial trouble and the City Beautiful Movement was sweeping across the nation. Pueblo residents began talking about building a magnificent public park that would complement the Mineral Palace and its fabulous collection of minerals from throughout the world. On June 25, 1896 The Pueblo Chieftain reported the U. S. Supreme Court had awarded Henry C. Brown of Denver (he built the Brown Palace Hotel and donated the land for the Colorado State Capital building) undisputed title to the land around the Mineral Palace. Brown was interested in selling a portion of his property for park purposes. The Chieftain reported he was interested in building 12 houses adjacent to the proposed park and would provide $10,000 for its improvement. As soon as the Colorado Legislature authorized the sale of Improvement Bonds the Ladies Park and Improvement Association intensified their efforts to acquire the Colorado Mineral Palace building and surrounding grounds for a public park. 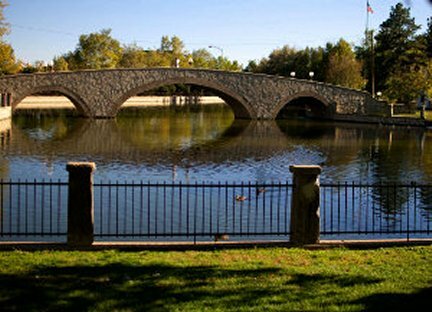 On August 3, 1896 property owners approved a bond issue of $70,000 for development of Public Park Improvement District No. 1 to enlarge the grounds and develop a park with all the finest amenities. 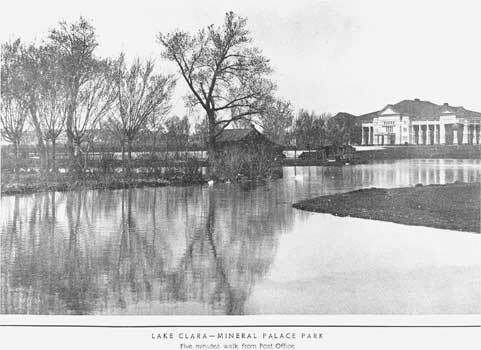 In 1897 the organization founding Mineral Palace gave the Palace to the city, and around it the Mineral Palace Park was built. Trees were imported from many parts of the nation. A lake was created, with a boathouse pavilion, and a bandstand on the lakeshore. The lake was named for Clara Latshaw, who served on the first Park District No. 1 Board of Commissioners and was instrumental in acquiring the land for the park. The boathouse, located on the west side of the lake, provided rental row and paddle boats for park's patrons. The park had zoological gardens with tropical plants and trees. There was an animal zoo and a children's playground. The Palace was closed in 1935 because of the poor condition of the building. Estimates indicated cost of repairs far exceeded the worth of the structure. The planning of Mineral Palace Park, with its main entrance at West 14th and North Main Streets, was started in 1896, and the Mineral Palace, shown in the background, was built shortly thereafter. Lake Clara, still visible today from Interstate 25 although it is much smaller, was one of the first improvements built. The lake was named for Clara Latshaw, who served on the first Park District #1 Board of Commissioners and was instrumental in acquiring the land for the park. During the early 1900s a boathouse on the west side of the lake provided rental row and paddle boats for parks patrons. Large portions of the lake and its island were removed during the construction of I-25 in the 1950s. The Mineral Palace, in a state of disrepair, was also removed. Pueblo's most mysterious woman was a free-coinage ambassador who dazzled Chicago world's fair visitors. Flanked by half-naked boy-gods spilling coins from cornucopias, her throne was a chariot/barge and her scepter was topped with a huge silver dollar. She was cloaked in sparkling minerals and shaded by a star-studded canopy. She didn't speak, but if she had, oh, the stories she could have told . . . Stories of the rip-roaring mining days in the Colorado high country, of the exhilaration as silver prices soared and the anguish as they crashed and the panic of 1893 descended, bringing widespread bankruptcy and unemployment. Stories of a fabulous Egyptian-style palace built on speculation and exaggeration in a small Colorado city where railroads and rivers met, a palace where her consort was a dusky king from the southern coalfields and where wildflower-painted domes rose to meet the sky above cabinets of precious gems and ores. She was the Silver Queen and like her castle, the Colorado Mineral Palace, she had a brief life and inspired many rumors, legends and questions. After 120 years, she's firmly rooted in Pueblo folklore, but mystery clings to her like the filmy gown she wore. We know the Silver Queen was designed by Pueblo artist Hiram L. Johnson, who built King Coal for the Mineral Palace, and that she was built in Pueblo and displayed in Aspen before being shipped by rail to Chicago for the World's Columbian Exposition in 1893. Aspen financed the elaborate statue, which paid tribute to the town's mining wealth and which promoted the continued free coinage of silver by the federal government. We know that millions of fair-goers viewed the Silver Queen in the Mines and Mining building at the Chicago fair during its six-month span, May through October. And we know that a Silver Queen statue — appearing somewhat different from the one that was designed by Johnson and sent to the Chicago exposition — was photographed at some time in Pueblo's Mineral Palace. The discrepancy in photos is what makes local researcher Robert Strader wonder if there weren't two Silver Queen statues, though he says he could find no concrete evidence to support his hunch. One widely circulated photo comes from "The Dream City," a photo portfolio from the Columbian Exposition which was published in 1893-1894 and which appears nearly identical to a photo stamped with Johnson's name and an 1893 copyright. Other, presumably later photos, show the queen minus some of her adornments and the statue missing key elements like a stag's head, a railing around the base and a shower of coins from each of the cornucopias. "When I saw (later) pictures of the queen, it seemed to be a different queen altogether," Strader says. "It could have been returned (to the Mineral Palace) and they worried about it being stripped (of valuables), so they did it before the vandals and thieves could do it." 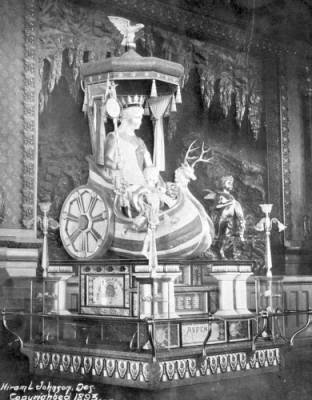 Strader says he could find no mention of the Silver Queen being returned after the Columbian Exposition, in either Aspen or Pueblo newspapers for several months after the Chicago fair ended. "I heard people say it was burned. There were two fires after the exposition closed, though one didn't reach the Mines and Mining building. The second was a pretty devastating fire, but I think it was in the summer and the statue wouldn't still have been there." Strader wrote extensively about "Whatever Happened to the Silver Queen?” in the March 2010 Pueblo Lore, published by the Pueblo County Historical Society. A short article in the March 12, 1893, Pueblo Chieftain suggests that the elaborate Silver Queen statue built by Johnson wasn't returned to the Mineral Palace. Under the headline, "The Aspen Silver Queen," the article said the statue, which had been under construction at the Mineral Palace since the previous August, was finished and ready to be moved to Aspen in a few days, where the unveiling would take place. "It is a very showy and interesting piece of work exhibiting artistic taste of a high order in the designer, and it is to be regretted that it is not to remain permanently in the Palace as it is a most appropriate and handsome companion for King Coal, the great statue of coal specimens from the mines of Trinidad and vicinity, placed in the Palace by the enterprising citizens of that city. . . . The citizens of Aspen will be proudly represented by the Silver Queen wherever she goes. It was only placed where it could be viewed by the public a few days ago and a great many visitors to the Palace have admired it." The Chieftain article states the cost of the Silver Queen was about $22,000. If the queen was supposed to be returned to Aspen, she either didn't make it back or all trace of her had vanished by 1976 when the city offered a $5,000 reward for the statue's whereabouts. Aspen's version of what happened to the queen is that the statue was returned to the Mineral Palace after it was exhibited in Chicago, according to Anna Scott, archivist for the Aspen Historical Society. "Looking at the pictures, it appears that certain things were removed right away like the coins pouring out of the cornucopias. We've had people say they saw it (the statue) or an account of it, and it wasn't solid silver. We know it was at least painted silver, and when the Mineral Palace was dismantled there wasn't much silver left on it (the statue), and it was dismantled with the palace. "It's always been a mystery to us," Scott says. "Everybody's looked into it." Another of the mysteries surrounding the Silver Queen is what the statue was made from. Everything from solid silver to papier-mache has been claimed. Puebloan Sterner Remple, who wrote a history of the Colorado Mineral Palace in 1937 for the federal writers project, states the queen was cast in bronze and had tin trimmings. She "sits on a throne in a boat — a masterpiece of fancy in the rock-bound town of Aspen. She is shaded by an umbrella-like canopy of tin." Remple wrote about the Silver Queen in present tense as if he could see her in the decrepit palace, though the rest of his lengthy account is in past tense. He noted that the marble steps on the statue's base once contained 18 silver dollars. A writer for the Aspen Weekly Times, upon seeing the statue at its unveiling at Aspen's Armory Hall, wrote on March 25, 1893, that the queen "is a 10-foot figure and represents an ideal American maiden of 17 years — the age of the state of Colorado. . . . The face, bust and arms are finished in silver, the hair is of white glass and the drapery falling in graceful folds is covered with dark brilliant minerals, except a scarf which is finished in pale blue crystals. . . ."
The queen's barge, which viewed from the side appeared to be a Roman chariot, "has heavy silver trimmings" and wheels with "silver tires six inches broad and two inches thick," according to the Aspen writer. Another Aspen Times account stated the Silver Queen figure was worked in copper, and the face, arms and bust were silver-plated. Scott says the queen definitely wasn't fashioned from a spectacular 1-ton silver nugget pulled from an aspen mine, as has been rumored, because the nugget wasn't found until 1893 and wasn't extracted until 1894. Strader says he can only speculate about the Silver Queen's composition: plaster of Paris that was painted silver. "But she had some (valuable) trappings. The stag's head was claimed to be silver. The railing could have been silver. Some of the minerals that were on the boat and taken off (if his reasoning about the photo discrepancies is correct) one suspects could have been valuable. The stars on the canopy might have been valuable. "That reporter who talked about it in Aspen (in 1893) couldn't have been fooled that much," Strader says. The Colorado Mineral Palace was enthusiastically celebrated at its grand opening on July 4, 1891. Fifty years later — in tragic disrepair and with or without its legendary Silver Queen — the palace was razed. Puebloans were preoccupied with other matters, including war in Europe, as a huge chunk of the city's and the state's glorious history slipped away. Close-up view of the statue of King-Coal in the Colorado Mineral Palace, Pueblo (Pueblo County), Colorado. The statue is made of coal, diamonds, and diamond dust, the figure is seated on a pedestal with a glass display case below. Lighting is supplied by four dual-bulb floor lamps, one at each corner of the pedestal. A sign reads: "King-Coal of Trinidad." 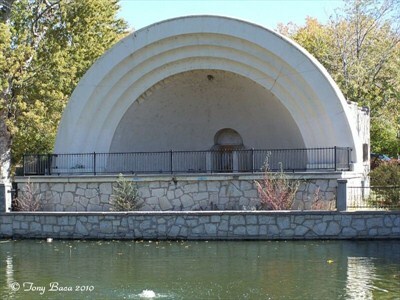 The bandshell is built of native limestone that was quarried from near the Beulah Highway. The bandshell was built in 1938. The structure was originally built by the WPA, with an emphasis on teaching building skills in variuos related fields such as masonry, carpentry, electrical and plumbing, in order to train workers in a job skill useful in later work. The design and craftsmanship show the progression of workers in training. The structure is a physical representation of the struggles experienced by Puebloans and all americans to survive the great depression. The bandshaell is showing signs of damage. There are some cracks in the dome. The English-styled Colorado Mineral Palace (pictured in article) stood majestically for 52 years before being demolished in 1943. Display cases circled pillars in the hall and other cases lined the walls. A jeweled replica, old photos and souvenirs, many memories are all that remain of Pueblo's fantastic Mineral Palace. Billed as the "eighth wonder of the world" and "the most unique building for the purpose of exhibiting the great, unlimited resources of the leading industry of our state ever conceived or attempted," the Colorado Mineral Palace opened July 4, 1891. No fanfare was spared that fine summer day. A brief 52 years later, the Egyptian-style palace was demolished; scrap metal from the building fed the ravenous appetite of World War II. According to the Sunday Chieftain of Jan. 3, 1943, demolition of the palace meant the enemy would be "blasted" and local children protected from injury. The children had played in the dangerous and dirty abandoned building while weeds choked what remained of the lawn and flower beds in the park outside. The Mineral Palace was intended as a showcase for Colorado's mineral wealth and its mining industry. It was designed by Pueblo architect Otto Bulow and built at a cost of $150,000. 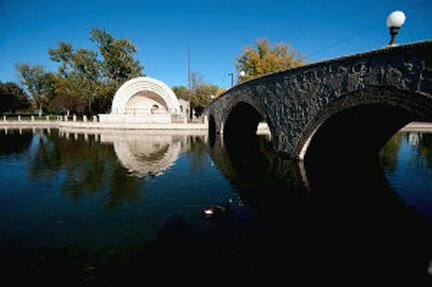 The park around it was developed after a $70,000 bond issue was passed in the mid-1890s. In the park were a lake, a boathouse, gardens and a zoo. The palace had a wooden framework, covered with marble, slate and metal panels. Its stone columns stood 28 feet tall. A large globe was positioned at each exterior corner. The palace hall could seat 3,000 people, and another 500 could be squeezed in if the occasion demanded. Lectures, concerts and plays were held in the hall, in the midst of a mineral collection promoted as the largest in the world. Some accounts say there were 150,000 specimens worth $2 million. Display cases circled pillars in the hall and other cases lined the walls. During its short life, the Mineral Palace was used for prize fights and auto shows as well as cultural affairs. During World War I, it became a recruiting station, and after the 1921 flood, a shelter. By 1927, the Mineral Palace was "a ramshackled, drafty structure, sadly in need of repair and with a majority of its mineral collections scattered or moved," according to the June 5 Chieftain of that year. The building was closed in 1935 because of its poor condition, but in 1936 it was used as headquarters for the Pueblo Recreation Commission. In 1938, the Mineral Palace was reopened after Works Progress Administration workers cleaned the mineral specimens and restored the display cabinets, but later that year and in 1939 the displays were dismantled and at least some of the minerals sent to the smelters. Some specimens from the Mineral Palace were displayed in the 1960s and early 1970s in the lobby of the Pueblo County Courthouse, but the display was removed when the courthouse was renovated in the 1970s. Miss Fry, who has done extensive research on the Mineral Palace, wrote in her 1973 article that ownership of some of the mineral specimens was transferred to the Bureau of Mines as early as 1901 and the specimens moved to the State Museum Building in Denver. In 1959, those specimens were turned over to the state Historical Society which later decided that they weren't especially significant. The society kept a few choice specimens and gave the rest to the Colorado School of Mines. 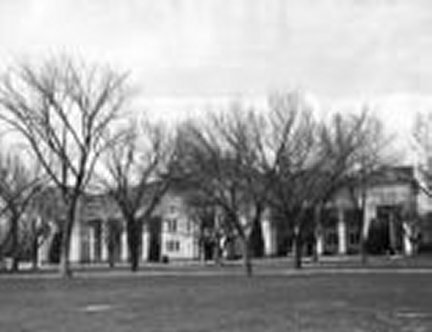 In 1991, on what would have been the 100th anniversary of the Mineral Palace, the curator of the School of Mines' geology museum said a "very big" collection of minerals had come from the state museum to the School of Mines in the mid-1960s. She also said she was not aware of any Mineral Palace specimens in the Mines collection. Photos taken inside the Mineral Palace in October 1942 - it was razed a few months later - show paintings and ornate trim still in place, but holes in the ceiling and trash on the floor. The once-mighty King Coal is in pieces. A glimpse of the palace's turn-of-the-century splendor can be seen in the "Pueblo Photo Album" exhibit in the White Gallery at Sangre de Cristo Arts Center through May 24. 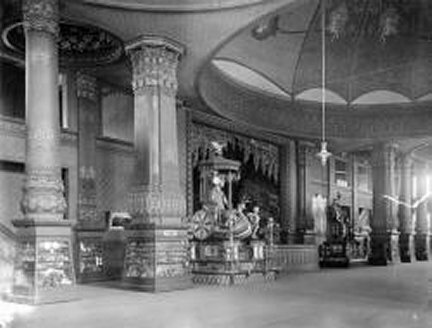 Photos of the Mineral Palace and the replica made in 1893 by silversmith Charles Otero for the Columbian Exposition in Chicago are also in the exhibit. The palace replica was loaned by El Pueblo Museum.